Voltron Season 7: Fans Are Upset About Shiro and Adam! Does Voltron Legendary Defender Season 7 Deserve The Queer Representation Points It Wants? Voltron: Legendary Defender Season 7 is available to watch on Netflix. However, if you were thinking of checking it out because of all the Shiro and Adam talk, you might need to prepare yourself for disappointment. As far as most Voltron fans are concerned, the way Shiro and Adam were handled in the series and promoted in media is nothing more than your usual queerbaiting. Minor Voltron Season 7 spoilers follow. You have been warned. The reveal at SDCC 2018 about Shiro being a queer character and having a romantic relationship with Adam during his past was a huge thing. Fans spent weeks before the premiere of the seventh season reading all of the interviews promoting the upcoming queer representation. After seven seasons, fans were finally getting what they wanted. But then the actual episodes were made available and it was an entirely different story altogether. Adam ended up being nothing more than another example of the ‘Bury Your Gays’ trope while Shiro continued following the trope of keeping queer characters sad and without a love life. So of course, disappointed fans took to Twitter to voice their feelings. As far as my opinion goes, having watched the finale, I was expecting a bit more. The interaction between Adam and Shiro (shown in a flashback) was quite vague and I wouldn’t be surprised if there are still many viewers who didn’t realize the two were more than just friends and were moving toward getting married. Furthermore, upon Shiro’s return to Earth, the show only gave him mere seconds to mourn Adam. There were no scenes of them being intimate with each other, saying that they loved each other, or even having a good time in each other’s company (in flashbacks). It would have been awesome to see Shiro remembering the time he was happy with Adam when mourning him. In contrast, Voltron season 7 ended up introducing a number of heterosexual romances. So, you can understand the reason behind the current fan disappointment. Also, if the queer representation in Voltron wasn’t supposed to be made clear, why even bother mentioning it? Why not just let it be a surprise for the viewers? I get the writers were excited about it. But come on! They know how passionate and vocal the Voltron fandom is. I am certain they knew Shiro and Adam were going to end up being a huge thing in the fandom as soon as the news was released. 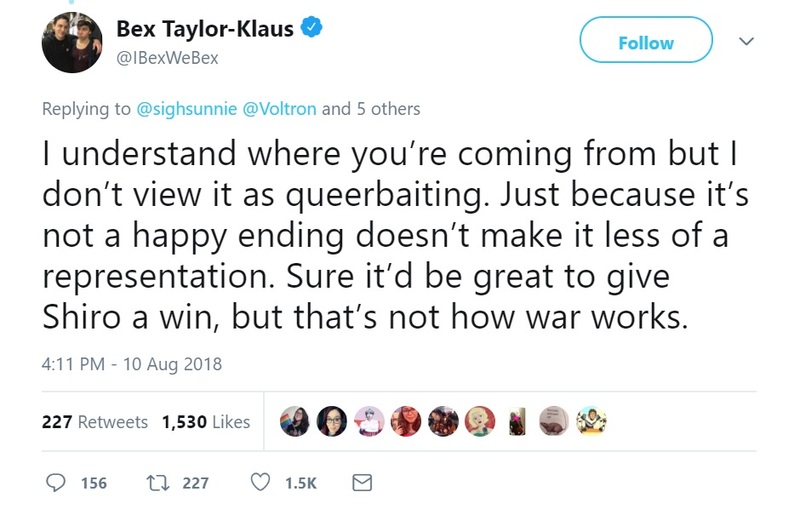 Bex Taylor-Klaus‘ responses, where war is being used as the reason behind all of the sadness Shiro experiences, isn’t helping matters. 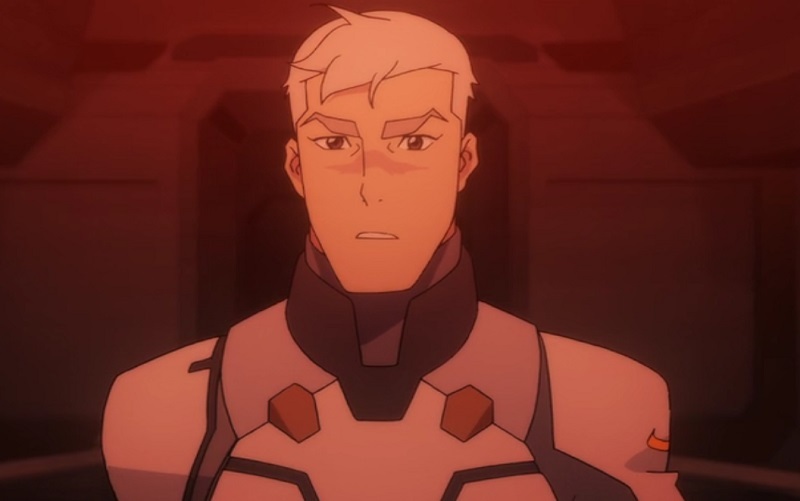 At least, Shiro can use his sad queer energy to create a curvy giant robot. Sigh! It is always content (Teen Wolf, The 100) that promote being inclusive and wanting brownie points that end up doing a bad job. I guess the next time some show decides to gain hype by boasting about upcoming queer representation in the series, we should be more cautious because queerbaiting is a real thing. I was warned by a Geekiary reader who left a comment on an article about Shiro’s reveal at SDCC 2018. I was warned but I didn’t listen! Shows that don’t promote queer representation too much or at all (Spartacus, Harlots, Claws) and then go ahead to deliver some of the best queer characters and writing is where it’s at. Considering what Voltron season 7 decided to do, I appreciate Steven Universe even more. Even Korra and Asami were handled a lot better.